(AINA) — Bishop Anba Makarios of Minya was the target of an unsuccessful assassination attempted this morning. The Bishop was driving into the town of el-Sario in Abou Qorqas, Minya province, when his car came under a hail of bullets from several unidentified persons. The Bishop’s driver was able to drive away and he brought the Bishop to the home of a local Copt, where the Bishop took refuge. But the gunmen followed, surrounded the Copt’s house and shot at it for over 90 minutes, causing extensive damage to its windows, doors and walls. Minya security were contacted immediately but they arrived 90 minutes after the shooting stopped. The head of Minya security told the media the Muslim people in the village were angry because they thought the Bishop had come to reopen St. Michael’s church, the only church in the village, which was closed 10 years ago for security reasons. The Coptic rights group Maspero Youth Union (MYU) issued a statement this afternoon warning officials of the spread of hardline guerrilla warfare led by Muslim Brotherhood members against Christians. MYU said what took place today was an assassination attempt, not, as was claimed by the Minya police, Muslims shooting in the air. 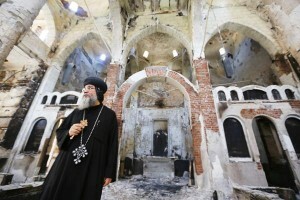 MYU demanded an immediate investigation into the behavior of the Minya security services, not only because of their slow response to the emergency call of the Bishop, but also because of their attitude towards the Copts in general and the “ongoing attacks on them, such as the burning of homes and property in Zakaria village in Minya and the expulsion of a Christian family from the village (AINA 9-29-2013). MYU called on the President and the Prime Minister to stop the systematic violence against Christians, who are targeted by spreading rumors or incitements in mosques to generate chaos against them and loot their property, in the complete absence of law and security, and “reconciliation” meetings that deprive the Copts of their rights. The province of Minya has suffered most after the ousting of former president Morsi, where over twenty churches have been looted and torched. The Muslim Brotherhood in Egypt and abroad, especially the UK, issued threats of assassination against many public figures, including Coptic Pope Tawadros II.